EatingWell readers vote for the best of the bunch. This trend is indicative of the number of Americans who want to know where their food comes from, what’s in it (no pesticides, please!) and how it’s produced. We’re eager to shake the hand of the woman who grew the dill, the guy who raised the hog. So in an effort to find the nation’s best, we started with the people who know: you, our readers. 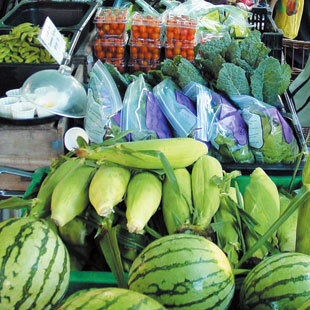 We offered an online poll, a way for you to tell us about your farmers’ market. We automatically tossed out markets that violate any of the cardinal rules: the food should be produced locally (either in-state or within a certain radius), sold directly by the farmer and raised in environmentally friendly ways. While not all the markets can promise everything is certified organic, the ones listed here do encourage sustainable practices and celebrate natural ingredients. We then looked for markets that highlight the food of their regions, markets that are places with a definite sense of conviviality and that have become cornerstones of communities, connecting the town and the farm. And lastly, we visited them and found our favorite vendors, cooking classes, lectures by farmers and much, much more. Months later, here are our favorite top five, followed by the five runners-up. To find a farmers’ market near you: localharvest.org or www.ams.usda.gov/farmersmarkets/.